It's been a great couple days to be an American. Landon Donovon brought our soccer team to the top of their group yesterday, and American tennis player John Isner won the longest match in tennis history this morning, defeating Frenchman Nicolas Mahut 70-68. The first-round Wimbledon match lasted just over 11 hours, totaled almost 1,000 points, and was suspended twice due to darkness. I have to say, seeing all these American victories has made it much easier for me to happily write about sports I don't generally follow. As for the women of Wimbledon, Maria Sharapova moves onto the third round by winning straight sets against Romania's Ioana Raluca Olaru. Venus Williams (ranked No.2) has also advanced to the third round, and twin sister Serena Williams, who is ranked first, is waiting to play her second round game. (Random fact: Venus and Serena were born in Saginaw, MI, about 90 minutes from my house). For those of you just watching to see hot athletes in sweaty, white outfits (I'm talking about you too, guys), there are plenty to be seen at Wimbledon. Guys, keep your eyes peeled for the usual suspects Ana Ivanovic (Serbia, pictured above), Maria Sharapova and Maria Kirilenko (Russia), and Caroline Wozniacki (Denmark). 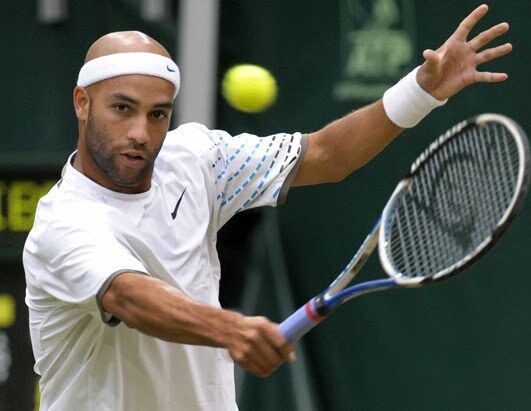 Ladies, make sure you watch the matches that include Rafael Nadal (Spain), Roger Federer (Switzerland), Andy Murray (Scotland) and my two personal favorites, Americans James Blake (pictured left) and the legendary Andy Roddick. In Wimbledon fashion news, expect to see a lot of Nike on the courts. 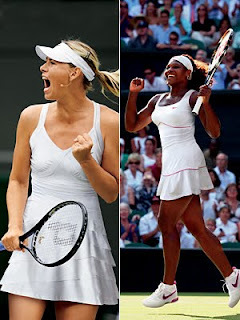 Both Maria and Serena are wearing Nike dresses: Maria (left) in a Lawn Rose Dress inspired by English rose petals, and Serena (right) in a Lawn Control Dress inspired by strawberries & cream. Both are equipped with Nike's Dri-Fit technology and have feminine accents like pin tucks on the skirt and square necklines. Designer Stella McCartney also dressed Caroline Wozniacki for Adidas. "It was important to show real women working out and showing their bodies and to marry the two world's, fashion and sport, which is what the collaboration is all about."